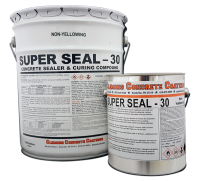 SuperSeal30 can be used for Stamped Concrete, Stamped Cement, Decorative Cement, Concrete Brick Pavers, Acid Stained Cement, Concrete Stains, and Exposed Aggregate. 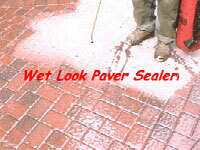 SuperSeal enhances the natural color of your Brick Pavers and Cement with a "wet" look. SuperSeal30 can be applied with a 1/2" roller cover. You cannot use a sprayer. SuperSeal30 will help sand erosion reducing the amount of weeds. One coat is recommended. Coverage is about 100 feet per gallon or 500 feet per five gallon. One coat will result in a high gloss sheen depending on porosity of brick. Extra coats will result in a higher gloss.